She-Ra originally came out back in June 2010 and was a pretty strong figure boasting three different head styles and a good amount of sculpting/accessories. However it was quickly discovered that the original release had a very solid skirt, restricting her ability to mount a Battle Cat or any other steed. We also found out shortly after She-Ra’s release that her steed, Swiftwind, was indeed coming out the next year. So Mattel got to work making us a new “She-Ra 2.0” that we later found out was Bubble Power She-Ra. Mattel had a lot to live up to with Bubble Power She-Ra. The figure in a way is sort of admitting they screwed up a pretty important part of the first figure … but you don’t want to just put it out there as an apology you have to pay for. So I think they went about it in the right way. The figure is passable as a quarterly variant figure (especially after seeing Snake Man Man-At-Arms) due to all the bubbly accessories and the new weapons. 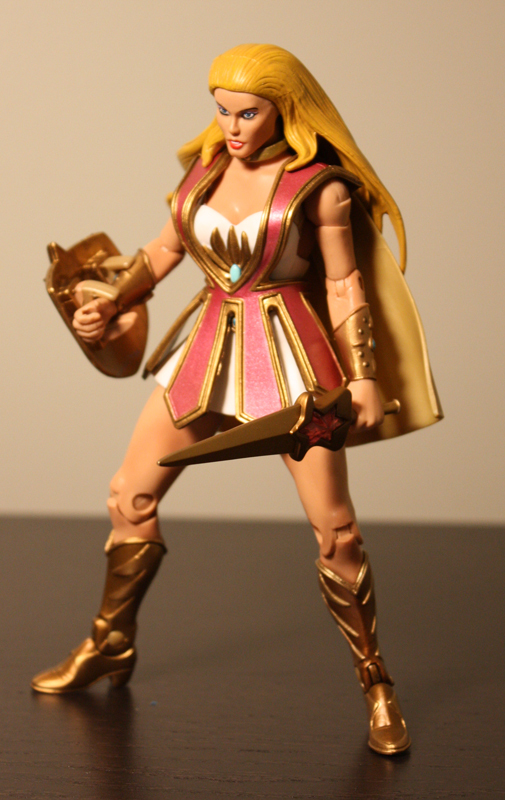 But the real advantage of getting this figure is using the base body to make the ultimate She-Ra. All of the “bubble” accessories come off which will leave you with the body to put the filmation head and cape on. From there add whichever weapons of your preference and you got a perfect She-Ra who will be able to ride Swiftwind. For now I will focus on what we get with Bubble Power She-Ra. I am not a huge fan of the new layer of hair going over the forehead, it looks fine when the tiara is on but just a hat less head looks a little strange. She has new and sharper detailing on her tunic. Also her boots and bracers are redone as well. The ankle’s seem a bit more sturdy this time around, not nearly as loose as the first She-Ra or even the typical He-Man ankles. The dress has a lot of give this time, and the new hip joints allow a lot of movement. She can ride a horse and do acrobatics! She comes with a comb-axe combination, a new sword, a new shield, and a bubble wand. I think the bubble wand is more throwback than anything else because it is huge and really doesn’t seem to fit in that well as a weapon you would want to use while fighting the Horde. The dress is nice, I may use my leftover parts to put together a Bubble Power She-Ra with the first version. Mattel made enough of a change with this figure that I feel it is warranted. I would even go as far as to say this figure would be more deserving of a quarterly variant than the Snake Men Man-At-Arms coming in June 2012. Now that her steed is out, it’s great to be able to have a She-Ra that can ride on it. I give her a little lower score, mainly because it took two figures ($40) to build one great figure, and when you are paying a premium already that is a sometimes tough pill to swallow.